Infielder Jason Leblebijian and LHP Shane Dawson respectively were named the Midwest League offensive player and pitcher of the week for the period of July 20-26. Both play for the Lansing Lugnuts. Leblebijian batted .400 (12-for-30) with four doubles, one homer, 11 runs batted in, six runs scored, two walks, and three stolen bases in his last seven games. On Friday he went 5-for-6 with two doubles, a home run, six runs batted in, two runs scored, and a stolen base in Lansing’s 18-1 win over the Dayton Dragons. This is the second time Leblebijian was named the MWL offensive player of the week this year. (The other time was for the period of June 15-21.) 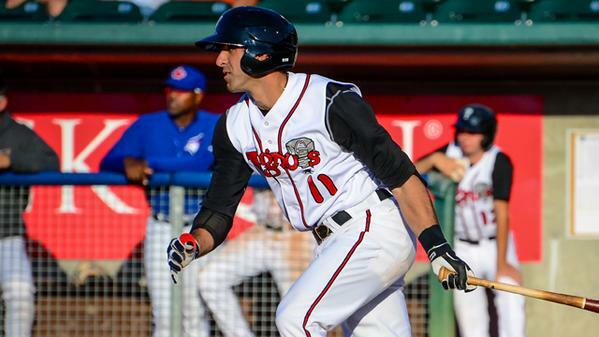 He is batting .288 with 7 HR, 32 RBI and 7 SB in 44 games with the Lugnuts this season. He batted .171 in 20 games with the High-A Dunedin Blue Jays earlier this year. This is the fourth season Leblebijian has spent time with the Lugnuts (12 games in 2012, 50 games in 2013, 100 games in 2014, 44 games in 2015). In 206 MWL games, he is batting .252 with 12 HR, 93 RBI and 19 SB. Dawson made one start during the specified period — the same game when Leblebijian drove in six runs against the Dragons. Dawson was stellar, striking out 10 while limiting Dayton batters to two hits and one walk in six scoreless innings. Overall this season he is 12-4 with a 2.85 ERA, 91 strikeouts and 23 walks in 94.2 innings (17 appearances/15 starts). Dawson pitched for the Lugnuts last season, too. He went 3-5 with a 3.38 ERA, 46 strikeouts and 24 walks in 56 innings (14 appearances/10 starts). This entry was posted in Dayton Dragons, Dunedin Blue Jays, Florida State League, Lansing Lugnuts, Midwest League. Bookmark the permalink.